Over the last 6 months, I’ve answered many of the frequently asked questions about the Cricut Explore Air 2 Machine. While answering these questions, I shared projects,party ideas, DIY tutorials, and lots of information. I created this round up post, including links to all questions. You can see how many different things you can make with the Cricut Explore Air 2. 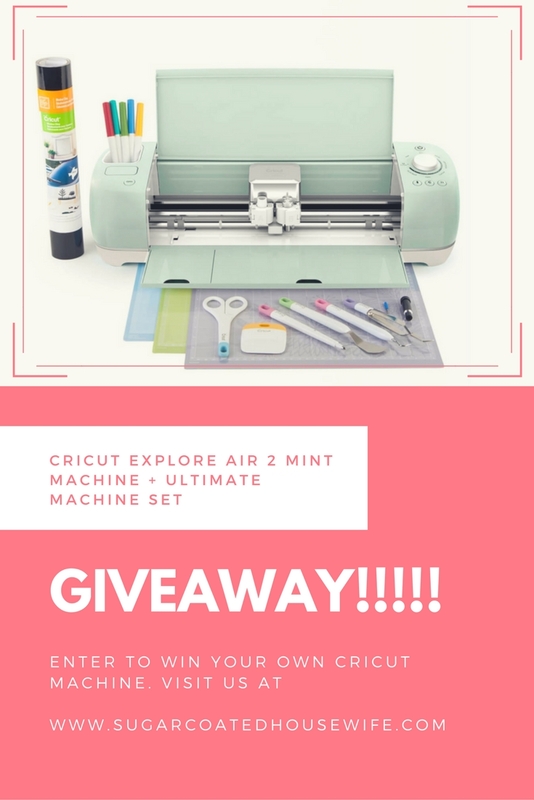 I love my Cricut so much and I am beyond excited to be hosting a giveaway for a Cricut Explore Air 2 Mint Machine + Ultimate machine set!!!!!! 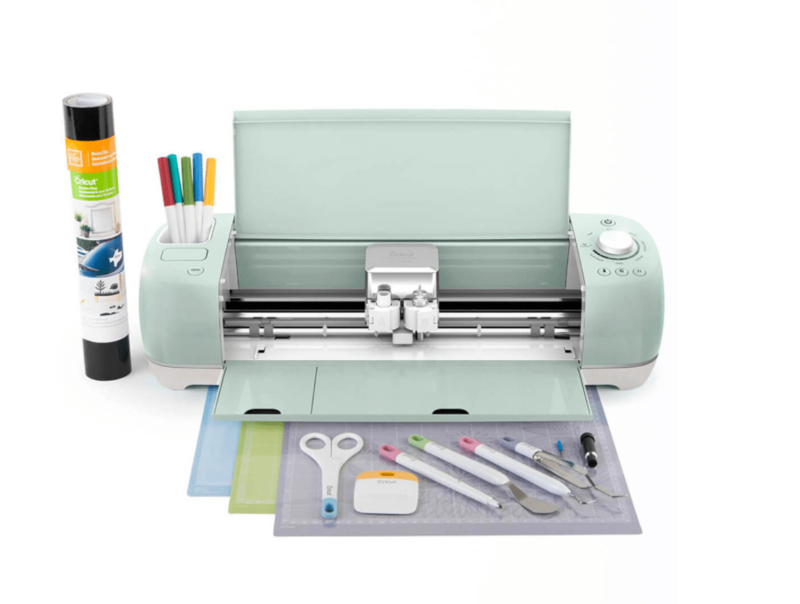 What questions do you have about the Cricut Explore Air 2? Here are 12 of the most frequently asked questions. each question is a link. Click on the question you have and it will take you to a post that will answer that question for you! 1.What is the Cricut machine? 2.How does the Cricut machine work? 3.Can I upload my own images with Cricut? 4.What different materials can I cut with the Cricut? 5.What different kinds of DIY projects can I make with the Cricut? 6.How easy is it to upload my own images with the Cricut? 7.Will it be easy for me to use the Cricut software to create Make it Now projects? 8.Will it be easy for me to learn the Cricut Design Space software to create my own custom projects? 9.How is the Cricut different from competitive cutting machines? 10.Will I be required to use cartridges with the Cricut? 11.What tools and accessories do I need to use a Cricut and how much do they cost? 12.Will I use the Cricut machine enough to justify the price? If you have any questions that were not answered here, please leave them in the comments and I would love to answer them. Giveaway will start August 23,2017 @ 12 AM and will run until August 30, 2017 at 12 AM Winner will be announced August 30th, here on the blog. Previous ArticleWHAT MAKES THE CRICUT MAKER DIFFERENT FROM ALL OTHER CUTTING MACHINES? I would love win this fabulous machine, because of the endless possibilities!! My first project will be to finish a church project with my husband! Oh my gosh I’m in wow mode this Cricut is so amazing! My first project would be to make cards for every occasion, I’ll always be prepared for any season and any reason. Love it! Ooops forgot to add – I would love to win this because it will save us money DIYing & my kiddos and I can do projects together. I want to win this because I want to learn how to DIY to so many different items! I would love to win this Cricut bundle because i would get to spend more time in my wine and crafting closet😂 I need to get cracking on some Christmas decor for the house. I want a Criquit because I am always doing projects, and feel bad having to always ask friends to help me with them. Because I do not have the right equipment. My first project would be some birthday cards and vinyl sayings for my daughters bedroom! I am thinking of all the cool things I could do with this machine. I hope I win! So awesome!!! I will be doing heat press vinyl making all kinds of shirts for every occasion!!! I have been wanting one of these for a while and this mint color is so pretty!! I love the built in storage and those tools would make projects so much faster, fun, and easier! I have been wanting to buy one and start making and selling greeting cards like birthday, Christmas, etc. I would LOVE to win! Thanks for this chance! I would love to win! Also great FAQ! I have loved cricut since the first machine was released and would love the newest machine! My first project will most likely be birthday party decor! I would love this for all my craft projects around the house and the first thing I would make are some custom shirts and onesies for my kids. My old machine is old… I make things all the time for school, church and parties so this would be amazing!!! I would love to win this! I would make vinyl decals to decorate my new home and tons of stickers for my happy planner. And of course I could make all kinds of decorations for my daughter’s birthday coming up. I have been dying to get the new explore air 2! I hope I win.I have so many things that I want to create. I definitely need to personalize my stainless steel insulated tumbler! A cricut has been on my wishlist for a couple years now but always get pushed aside for other things (like diapers and kids shoes) I hope to start a stsy at home business for printables, vinyl, etc. A cricut is just what I need and this one is in my fav color. If I won the first thing would be lots of fall decor! This is an awesome opportunity for someone who may not have readily have funds to get a cricut and start crafting (like me)! Thought 1 – I am thankful for the comparing and contrasting of the cricut and the silhouette. I was having a hard time deciding and it was answered in depth in a common question. Thought 2 – I was pleased to learn that I can upload my own images as well as their being platforms to get others. This machine would be a time saver! Up until now I’ve been using a ruler, pencil and scissors. Love doing different projects especially for my classroom and students. My first project would be vinyl stickers for my car! I would love one of these to decorate my wedding! This machine seems awesome! I have the original cricut and love it but am looking for an upgrade so I can do more customized projects. My first project would be something for my sons third birthday!! Holiday cards will be my first project! I love your post. Excited to see more of your blog. I’ve been wanting one for a long time. My first project will be a few tee shirts. Finally I would be able to do vinyl instead of hand painting everything. Would love to win and let the Christmas crafting begin! I’ve been dreaming about owning a Cricut machine for a long, long time! I’d first play around with designs to make my own notecards, then work of making iron-on designs for t-shirts. What fun! I’d love to be able to win so that I could make some awesome birthday decorations for my daughters birthday. I love that you can upload your own images and create personalized decorations. There are just so many things you can do with this handy machine. I would love a cricket! I am expecting my first child and am very crafty! This is something i will use often! I can’t stop thinking about all the things I could make with the Cricut! Thanks for a chance to win!!! I would love to win this because I love all sorts of DIY projects, and this machine is a must have! I would love ti make banners and cards for pictures, and I would try to make cute shirts for my kids! I would love this for my daughters classroom, we would make lots of holiday decorations, the students would love this!